I have some very exciting news to share with you! My dad is in town from Michigan for a visit, his first official visit since he moved back to Michigan from Tennessee EVER! If you read my blog or know me well, you already know this so this isn’t news, right? Not to keep you in suspense any longer, the news I am talking about is that my dad came all of the way from Michigan to bring me…(insert exciting drumroll) Michigan Chinese Food!!!! OHMYSTARS! (and moon, sun, and all the planets!) It is that good, for real. You are all very jealous now, I know. Try not to covet my delicious Michigan Chinese food, please. If you come to my house I will share with you, but eat first because I probably will not give you enough to actually make you full. (Sorry, not sorry.) How can I be so rude and selfish? Because this is the best, most delicious blend of just the right spices, rice, veggies, sprouts, and pork that you will ever taste. This is the stuff dreams are made of. I crave this stuff like a pregnant woman craves pickles and ice cream. I know that is cliché and pregnant women don’t really crave pickles and ice cream, but you get my drift. Only the Chinese people that are immigrated to Michigan can make it this way. Even up there, it has to be true Chinese immigrants, or descendants of said immigrants, for it to taste this way. I am guessing that China is much like the USA, and foods are different depending on which part of the county you are in. I’ve never been to China, so those of you that have can maybe tell me if I am right about this. They have some of the same dishes on their menus that we have here in Tennessee, but even those do not taste the same. I think it is not only the way they prepare them, but also the spices they use and the quality of the ingredients. My go-to dish is Almond Boneless Chicken, and I have never seen it on a menu anywhere else in the country, and I try Chinese food in every city I spend more than one day in. I have found dishes called Almond Boneless Chicken, but it is not prepared or served the same way. This is breaded chicken, served on a bed of iceberg lettuce with sliced almonds and then a brown gravy-like sauce on the top. Then there are the egg rolls, oh the egg rolls! They are crispy and flaky on the outside, and inside they are hot and soft and filled with cabbage, veggies, pork, and the perfect blend of spices. Before any of you tell me how unhealthy this meal is, I already know this and I do not care. 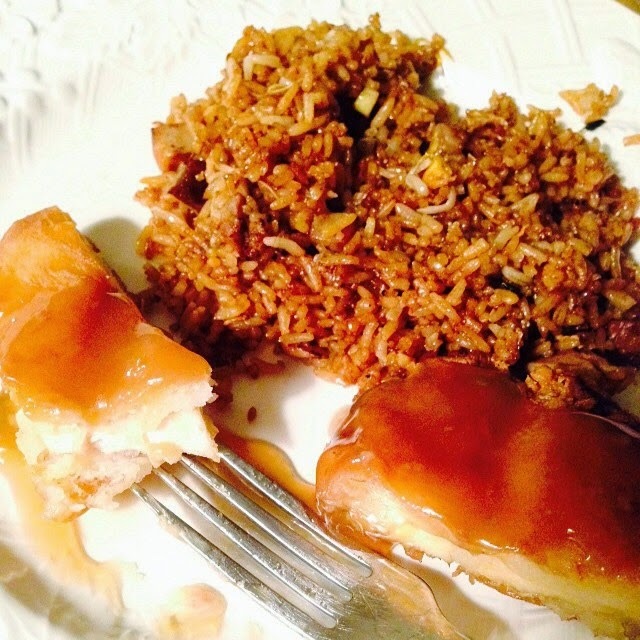 You have to have happiness in your life, and this includes Michigan Chinese food. When I visit Michigan, I try to eat it at least once a day. The entire drive home, I usually think about how I should have bought some to freeze and bring back with me, although I never have. I then crave this meal daily for a few weeks, and then less often forever, until the end of time, or until I get to back up to Michigan and have some. My family will back me up here as I mention it frequently, “I could go for some Michigan Chinese food!” We have a pretty good restaurant here in Powell that I will eat on occasion to help with the withdraw effects from the crack-like food. My dad is my hero now, and I know that he truly loves me with all of his heart because he brought me this food all of the way to Tennessee. Happiness is Michigan Chinese food. All of my Michigan peeps, please beg your local restaurant to move to Knoxville or Powell and tell them I personally will keep them in business. Or they can give me the recipe and a few cooking lessons and I will attempt to recreate it myself. They are pretty tight with those recipes, I have asked before, so I think if you get one we could probably make some money. I know you all think I am completely crazy now, and I am, but that is a different story for a different day. I am speaking truth here, and you need to either drop by my house today for a taste, or rush up to Michigan first chance you get and have some of this deliciousness. Your welcome. I managed yesterday to clean out a couple kitchen cabinets, including our medicine cabinet. I am embarrassed to admit I had vitamins in there that had expired in 2008. Yep, 6 years ago, actually the year the boys were born. I cleaned that cabinet out about 9 months ago and I have no idea how I missed those expired bottles. I am wondering if, upon reading the dates, I felt nostalgic and just kept them because of that. I know it sounds stupid, but if I had been having a bad day and had the boys on my mind then I can see myself doing that. I also have one bottle left with Michael’s name on it. I plan to keep it forever. I long ago threw the actual pills out, but it is the last bottle of medicine I bought for him. I keep it in the very back of the basket, but when I am searching for something specific and reading all of the bottles, I find it comforting when I read his name. It is surprising, even though I know the bottle is in there, when it ends up in my hand. I always let myself read it a few times and just hold it for a minute while the memories flash through my mind. Usually it is comforting; sometimes it is more than I can bear. It is funny how grief can come back at you when you are not expecting it and knock the wind right out of you. I can sometimes be taken back instantly to that moment, the last moment I was with him, and I can see his face and his expression. I am still not ready to share that, and there are only three other people in the world that were there with me that day. I bet they still see that look in there memories, too. I will only say it isn’t pretty, and it is everything except comforting. While it is such a blessing to those left behind to know that you are going to lose a loved one and to be able to say goodbye, it is so much harder for the dying person to have to choose to go. I find it so horrible that someone with a terrible, terminal illness has to not only suffer through the illness and the treatments, but then has to decide not to live anymore. People say “the cancer took him” but that isn’t exactly how it goes. It is a choice to finally let go, harder and longer for some than others, but it is a choice. This week in my bible study, “The Intentional Woman,” I learned how Jesus and I have something in common. I have read this particular verse many times before, but did not take from it what the book explained to me. It’s so great that God’s word will meet you where you are and give you something new and exactly what you need every time. Matthew 14:13 “When Jesus heard what had happened, he withdrew by boat privately to a solitary place.” Jesus needed some quality alone time! How awesome is that for those of us who need this on a regular basis? This simple verse teaches me so much about Jesus and myself. Something that I need to help me emotionally is also something that Jesus needs. The next verse says that the crowds followed Jesus and when he saw the large crowd he had compassion and healed them. He had compassion. Do I have compassion for my family when I am trying to sort through my thoughts and need to be myself? Sometimes, of course, but other times I am snappy and grouchy. You can bet the next time I will be slower to snap, and have compassion for their needs. Harper is stirring, so I will save the rest of my thoughts for the next blog. Have a great weekend! I have been so productive today, I am actually writing tomorrow’s blog – drumroll- tonight! Y’all that is a record for me! My house is clean, my kids are happy; everyone got to where they needed to get to today, and made it back home. I worked on my business (I am a new Young Living Essential Oil Distributor so I had some meetings and delivered some oils.) I even got our team registered for the Buddy’s Race Against Cancer to celebrate and remember my late husband, Michael (thank you to his daddy for lighting that fire!) If you want to join us for the race on November 9, you can join our team by registering here Buddy's Race You all know what is coming, right? I am going to be all inspired, disciplined, and productive for a few days, weeks, maybe even months. Then, something big will happen, hopefully this big thing will be positive like I will win the lottery (I know, you have to play to win, but maybe I will start.) The something big will get me all off kilter, and I will cease from being productive. It will take another 31-day challenge to get me back on track. But I am learning skills during this challenge to carry me through another hiatus. I am learning how to be productive and stay productive. God is working in me. I will let you in on a little secret, actually a couple little secrets. First, I wrote that first paragraph last night and then went to bed, leaving this to be finished in the morning. Second, I woke up at 2:30 am and couldn’t go back to sleep. Third, I have a little anxiety and feelings I have been trying to ignore for a few days. Anyone who has been through traumatic things has these feelings. Here’s the deal and the real secret- the year leading up to Michael’s sickness I was plagued with worry. I thought it was because Billie was going to be sick or something, I really wasn’t sure, but I had these anxiety-ridden, sleepless nights. I would sneak into her room and sit in the floor by her crib and pray over her. After Michael got sick I decided that his cancer was the big “thing” that was haunting me. Maybe it was the cancer itself that I could sort of feel, or maybe it was God giving me an intuition, or maybe I am completely crazy and was simply battling anxiety or depression. I think it was God giving me a warning, maybe I believe that because that is comforting, but I have had these sort of feelings since then and tried to ignore them. At the time I have these feelings, I am never really sure about what or why I am having them, so it is easy to just dismiss them. Of course, hindsight is always 20/20. Another time I have struggled with similar feelings was with my pregnancy with the boys. I know, every pregnant woman has worries, fears, anxiety, trouble sleeping, but hear me out. 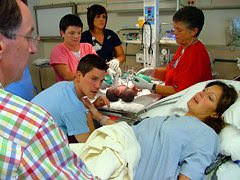 I knew from the get go that I was having a boy, because I had a feeling, not because I had an ultrasound because I didn’t. We declined the 12-week test because it was only to check for birth defects so that we could terminate if we chose to and since we were not going to terminate for any reason, we declined this test. We had no reason to think there would be anything wrong, and the baby had a good heartbeat so my doctor agreed it was unnecessary. When I got a couple weeks further along and could feel the baby move, I started having these thoughts. I felt the baby move much earlier than I did with Billie, but I figured that was because I knew what to look for this time around. I remember asking my doctor a few times “How big should the baby be now?” He would usually compare it to a fruit or vegetable “about the size of an avocado, cucumber, eggplant,” depending on how many weeks along I was. I would then ask, “Are you sure there maybe isn’t two? Because when it kicks, I feel it way over here (pointing to one side), and then immediately I sometimes feel another kick way over here (pointing to the opposite side), and I don’t feel it jump over there. I mean, can it reach with its hand this way and its foot the opposite way at the same time like that?” His answer every time, God bless him, was “One heartbeat, one heart, one baby. There can’t be twins with one heart.” Except for when there is. I wonder if he also remembers those conversations with me? The day of my big ultrasound he was out, so I didn’t see him that day. I never saw him again since the practice referred me to a perinatologist, naturally. As soon as I found out I was having conjoined twins, within minutes, those conversations with him came back to my mind and have haunted me ever since. Not that they would have changed anything, and I think it was another way God was protecting the boys and me. What would I have done if I had known the boys were conjoined at 12 weeks? They pushed me to terminate at 20 weeks on up to 27 weeks, so I imagine they would have pushed me even harder at 12 weeks. I may have felt that was the best choice at 12 weeks. It may have been easier to decide to terminate with such a grave prognosis coupled with the fact that I hadn’t felt them kick yet. I have always felt that deep down I knew I was having twin boys from the beginning, but I just didn’t trust my instincts enough. I didn’t tell anyone else except for my closest confidants that I thought maybe it could be twins. I didn’t want to be wrong, and I was embarrassed for even thinking it. So dumb. I could go on with more examples, like the conversation I had with my perinatologist at 23 weeks along during my pregnancy with Harper, a week before I had Harper, asking him if he thought I could have accreta (FYI I did, and he said there was almost no way and there were no symptoms and I wonder if he remembers that conversation, too.) Basically what I am getting at is that these are feelings that you want to ignore because you want to be wrong. I have been wrong, too, I will add that. Having been wrong in the past makes it easier to dismiss similar feelings. These feelings that are waking me up in the middle of the night are not clear, and could honestly just be my crazy, traumatized brain worrying unnecessarily. I am praying for peace, discernment, and protection. I will not let this take over my life, or keep me from my goals. I have mentioned before how when I am worried about something I allow it to take over my mind and my life. Not this time. I know that the enemy wants to rob me of my joy and wants my attention. I will not let that happen. I am in a good place right now with my walk. I am in the Word, my prayer life is strong, and I am feeling more confident than ever with my relationship with Christ. I will hold fast to that and give my worries to the Lord. Productivity: (proh-duhk-tiv-i-tee) noun- the quality, state, or fact of being able to generate, create, enhance, or bring forth goods and services. We all know this. I am not trying to teach anything new here, only trying to teach myself and share my experience with you. I am learning a lot already through this challenge. I am learning a lot about productivity, but even more about myself. These are probably things that I already knew, but was either ignoring or just being naive about them. This will be a short post because I only have 10 minutes before I have to get the girls up and ready for the day. I got up at 4 this morning. Well, I woke up at 4 am and laid there for an hour trying, in vain, to go back to sleep. So once I got up, I got my coffee, turned the news on, and grabbed my bible, books, journal, computer, and phone. I took care of some to-do things, scrolled Face Book, and worked a bit on my bible study before turning to my writing challenge. Why, if I got up at 5am, do I only have 10 minutes to write this blog? I only have 10 minutes because I wasted my morning. I enjoyed most of my quiet time this morning, but I was very wasteful with my time. I spent way too much time on Face Book and doing other things that seemed important at the time (like planning our next trip, and catching up on news), but really could have been skipped all together. I should have spent 5 minutes on the Internet, and 1 hour spending time writing rather than the other way around. I am learning that I have this lazy side to myself where I like to read what others have written and just “veg out,” as I call it, rather than doing the work that I need to do on myself and for myself. It is hard to be self-motivated and keep myself in a productive state when I do not have restrictions or deadlines. When I began my morning, I felt so happy and inspired that I had two hours in front of me with nothing but me on the list. I had two hours to study, write, pray, journal, and accomplish. But I squandered at least an hour of the time, and so, after a morning that looked so full of potential, I now begin my day feeling disappointed with myself. What a shame, and I wish I had only insightful, beautiful things to tell you, but I also want to be truthful, so there you have it. I need to have self control and manage my time better. I do not want to leave you on a bad note, so I will give you this little gem that has been floating around my mind for a couple of days: Titus 2:11 & 12 “For the grace of God that brings salvation has appeared to all men. It teaches us to say “No” to ungodliness and worldly passions, and to live self-controlled, upright and godly lives in this present age…” Here's to a great day with better time management! I am SOOOO excited to take on an October Writing Challenge. Fellow blogger (and mommy, wife, nutritionist, believer- the list goes on, we’ve got a lot in common!) Lauren Morgan of Adventures of Jack and Me (and she is a contributor at Knoxville Moms Blog which you should follow immediately because they are FANTASTIC!) shared her challenge yesterday (ER… a couple of days ago now)of challenging yourself outside of motherhood and daily life. (Read that blog here: October Challenge) Just to sum it up, basically choosing to concentrate on something every day outside of motherhood. Being a stay-at-home mom is harder than I thought it was going to be. 3.5 years later, I am struggling to find myself. Now don’t get me wrong, it is truly the best job I have ever had. I love being the “bones” to my family. I am the go-to person here for everyone. And most of my days are spent doing something for one of the kids or Matt, mostly the kids. I love that, too, but here lately it maybe has gotten me to the place of burnout. Not all of the time, but sometimes. I find three the most challenging age, and thirteen maybe is the second most challenging age. How did I end up with two most challenging aged children at the same exact time? I am certain God is trying to teach me something yet again. So all of this is just a little back-story to the reason I don’t feel very productive anymore. I am an introvert. Everyone that knows me well knows this about me. If I am worried about something, I will not hear anything you have to say and I will not be able to think about anything except for the thing I am worried about. If I have a lot to get done, leave me alone and let me do it. Do not help me, just leave the room, house, city, whatever and stay away until I am done. When we are in a hurry to get out of the house, I have this constant list going through my mind of everything I need to do to get us out the door. Now, a wise woman would write this list down, but I never feel I have time for that so I run my list through my mind and mentally check the things off as I go. This worked great when I was single and childless, and even worked well when it was just Billie and me. Add a husband and a second child and it basically doesn’t work anymore. So all day long I spend my time circling the house and starting lots of things and finishing almost nothing. Like this blog post I started on October 2, it isn’t even that long, and I have come back to it several times, but it took getting up at 4:30 am in a quiet house to get it written. Up until that last sentence, I was on a roll. Then Matt came in here to try to figure out why our shared camera rolls on our newly updated iPhones no longer share. He not only came in here, but he took over my computer screen from his office (he is like our IT guy here at home so he can control my screen from his)-in the MIDDLE OF A SENTENCE!- to get me to read an article about said camera roll probs. My struggle is real, pray for me! I am leaving you with this: I am working on productivity in my life, my home, my family, my brain and I am accepting the October writing challenge and I will be writing about productivity.